It’s my birthday weekend day 2! Hopefully you have already entered my giveaway to win a pair of Freshly Picked moccs! 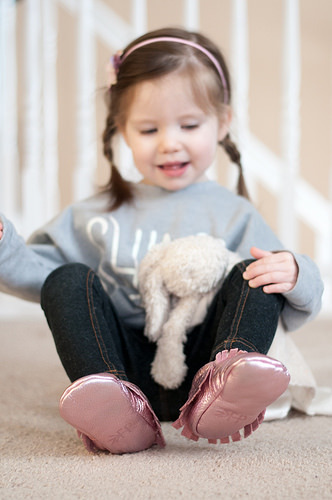 The amazing team at Freshly Picked sent Little Boo and I a pair of their Frosted Rose moccasins in a size 6 to review. We have been FP fans for a long time and this new pair did not disappoint! Little Boo loves them so much and she’s back on the blog to tell you about them herself! Did everybody miss me? My mom told me how you all loved reading about when I turned two, so I’m excited to come back and talk to you again. 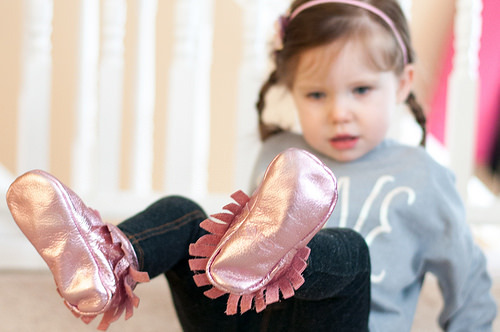 Today I am going to tell you about my new pink moccasins because I love them so much! As we know I am two, so I like what most two-year-olds like: my mom, my dad, my sister and anything that she doesn’t want to share with me. I also like my cats, my binky, my bunny, my pink blanket, Sofia the First, Hello Kitty, fruit snacks, singing, going to the playground, riding on escalators and last but not least, my collection of Freshly Picked moccasins. My mom buys me a lot of accessories. Definitely a lot more than she would want my daddy to know about. She spends a lot of time fixing my hair and putting pretty clips or headbands in. I like to wait until she’s done, pull them out and hand them back to her. I guess you could say that we don’t really see eye to eye on the whole hair accessory situation, but we do see eye to eye with these moccasins that she seems to like so much. We just got a new pair. They are shiny and pink and I love them, but I call them purple just to mess with her. These moccasins are very soft on my feet and they make my toes feel so nice. They aren’t heavy like some shoes that I have and I can even put them on all by myself! It’s winter now and while I can’t wear them to play in the snow, I can wear them everywhere else! Oh, except for bed. On the day that mom took them out of the mailbox and gave them to me for the first time, I did not want to take them off. I let her take them off of me to put my pajamas on, but then I wanted to put them right back on. Sadly, she took them off again before putting me in my bed. I don’t know why I can’t wear them to bed, but Mom is pretty firm on that one. So other than bed and the snow, I like to wear them lots of places! They are really good for restaurants or to go to the movies. I like to sit up on my knees to get a better view of things and these are perfect for that because they aren’t hard to sit on. My mom gets them a little big for me because she says I can wear them longer, but it also means that my big sister can wear them too. This can be problematic at times. We both can’t wear the same pair at once and if she wants to wear them, I want to wear them even more. It’s a sister thing, you know? So if you are thinking about asking your grownups to buy you a pair, I say go for it! You will like the way that they feel on your feet and you will love how pretty they are. And if you don’t want to be pretty because you are a boy, don’t worry – they have boy colors too! Now I gotta go because it’s almost time for my nap and I need to see if I can sneak those moccs into my bed before Mom knows where I went. 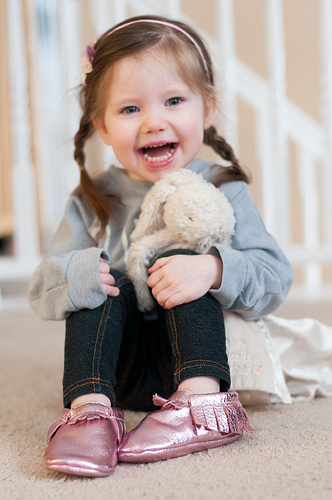 As you can see, LB loves her new moccasins! I bought her first pair of FP moccs about six months ago and they still fit her and look great. All of these moccasins are made from super soft leathers that are thick and durable and hold up well to a toddler running around and playing. If they get dirty, I just wipe them with a damp cloth and they are good to go! I would definitely have bought these when the girls were babies if I had known about them, since I only do soft-soled shoes for at least the first year because of their growing little feet. These moccs are great for when I have LB in the sling or the Ergobaby because they don’t get caught getting her in and out and they are soft up against me. I love that these are handmade in the US by a mom and her team. My favorite thing about these moccs and what sets them apart from any other shoe and makes them worth every penny is that the elastic around the ankle keeps them from falling off even if you buy them a little big. I definitely like the girls to have time to grow into them, but I also am able to buy them so that they fit both LB and PR at the same time. I have not found another shoe that both my 2 year old and my 3 1/2 year old can fit at the same time. Right now if I buy a size 6, there is room to grow for LB, but they are still totally wearable and they fit PR perfectly. I actually bought PR her very own pair for Valentine’s Day, Fool’s Gold in a size 8. She was so happy to finally have a pair that she doesn’t need to share! These moccs are super cute and if I could buy every color, I would! Head on over to Freshly Picked’s website to snag a pair for your babe. Be sure to follow them on Facebook and Instagram which is where you can find out about sales and new color releases. And don’t forget to enter to win a pair! Turning three-two and a giveaway for YOU! ← Turning three-two and a giveaway for YOU! wow the photos in this post are gorgeous! Thanks!! Good thing for the Original Boo!! Awesome! I am so in love with accessories myself 🙂 I have 3 little ♥ bugs myself Jazlyn 5 Jordyn 4 and Ariana 4mths. 3 girls and I must say its so fun spoiling them! The best part is all the cute accesorries can be handed down 🙂 great photos keep up the awesome blogs! Thank you! And I love having girls… three must be so much fun! My husband took the pictures and we were so lucky to get some cute ones. LB was not in the mood! I may or may not have had to bribe her with M&Ms. She’s a smart girl, learning to negotiate for chocolate. She is a smart little cookie! Did you read the post about the time she told me the cat kicked her? It’s a few back and will make you laugh! Great blog post and review! Enjoyed reading it! We absolutely love our fp moccs as well! I have 2 boys, 10M and 3y, and they wear their moccs everywhere! So durable and the best looking baby shoes I’ve ever seen! Thank you so much!! We love our FP moccs too! ok, she is a doll! look at her luscious hair! i am jelly. Fingers & toes crossed!!! Glad I can across your blog too! Thanks for the chance! Fingers & toes crossed!!! Glad I came across your blog too! Thanks for the chance!